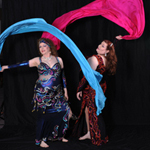 Su'ad and Farasha invite you to another exciting afternoon of dance! Come and shimmy for a great cause, to support The Associated Human Society's Popcorn Park Zoo! Join us as we share an afternoon chock full of beautiful dancers and dances of all styles. The Desert Moon Dancers will be there! Take the Garden State Parkway South to exit 88 (Lakehurst/Lakewood/Brick Twp and Route 70). Stay in the left lane of the exit ramp. At the light make a left onto Route 70 East. Follow Route 70 for 1.4 miles, and turn right onto Cedar Bridge Avenue. Turn right at the next traffic light onto Aurora Drive. Take the Garden State Parkway North to Exit 90 (Brick Twp/Lakewood/Pt. Pleasant). This exit will put you on Chambers Bridge Road. Follow Chambers Bridge Road for six lights (1.3 miles), and turn right onto Route 70 West, staying in the left lane. At the first light, turn left onto Cedar Bridge Avenue. At the next light turn right onto Aurora Drive.